Consciousness is subjective experience, the “what it is like” to perceive a scene, recognize a face, hear a sound, or reflect on the experience itself (Tononi et al., 2016a). Identifying the neural correlates of consciousness is important scientifically and clinically, to improve the detection of awareness and to design new therapies in patients who remain unresponsive after brain damage (Gosseries et al., 2014). Although frontal cortex is crucial for intelligent behavior and cognitive control, its involvement in consciousness remains a matter of debate (Koch et al., 2016a). It has been widely assumed that prefrontal circuits are essential for consciousness, either alone (Del Cul et al., 2009) or in conjunction with parietal areas (frontoparietal network) (Bor and Seth, 2012; Laureys and Schiff, 2012). In this Perspective, we will critically review the evidence for the role of the “front” versus the “back” of the cortex in supporting consciousness. By the “front,” we refer to prerolandic neocortex, including dorsolateral, medial prefrontal, anterior cingulate, and orbitofrontal areas. By the “back,” we refer to neocortical regions within the parietal, occipital, and lateral temporal lobes. Due to space constraints, we will not review possible contributions to consciousness of the medial temporal lobe and of the insular cortex (Craig, 2010; Seth et al., 2011; Quiroga, 2012), except for pointing out that consciousness is preserved after bilateral lesions of these areas (Corkin, 2002; Damasio et al., 2013). We will also not discuss the essential role of different brainstem and subcortical mesocircuit structures in regulating the level of consciousness (Brown et al., 2010). We emphasize, however, that consciousness is absent in vegetative state (VS) patients who suffered widespread corticothalamic damage even when brainstem activity is preserved (Laureys et al., 2004). We refer to other reviews for the complex interplay between consciousness, memory, and attention (Tononi et al., 2016b; Tsuchiya and Koch, 2016), including spatial neglect (Corbetta and Shulman, 2011). Finally, we will focus on the empirical evidence about the role of the front and the back of cortex leaving aside theoretical interpretations and predictions (Lamme, 2006; Dehaene and Changeux, 2011; Lau and Rosenthal, 2011; Boly and Seth, 2012; Tononi et al., 2016a). The neural correlates of consciousness (NCC) are defined as the minimal neural mechanisms jointly sufficient for any one conscious percept (Crick and Koch, 1990). Content-specific NCC are the neural mechanisms specifying particular phenomenal contents within consciousness, such as colors, faces, places, or thoughts. 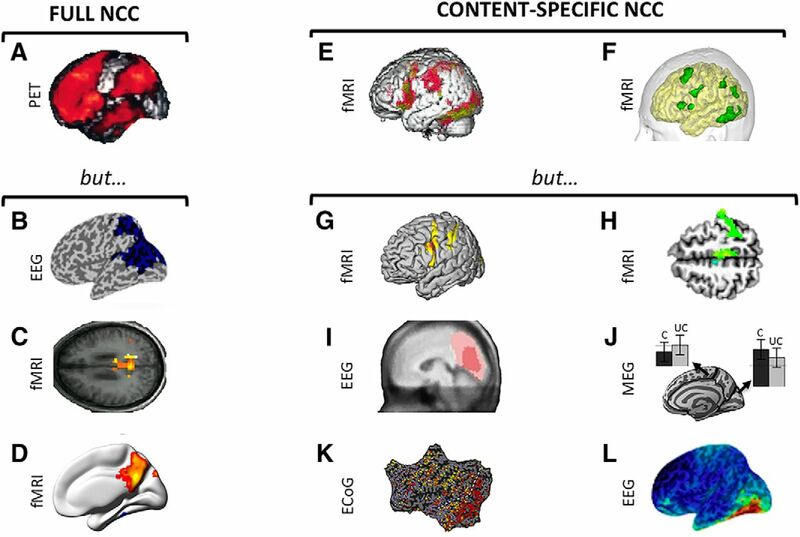 Experimentally, content-specific NCC are typically investigated by comparing conditions where specific conscious contents are present versus absent. The full NCC can be defined as the union of all content-specific NCC (Koch et al., 2016a). Experimentally, the full NCC can be identified by comparing conditions where consciousness as a whole is present versus absent, such as dreaming versus dreamless sleep. In principle, the full NCC can also be approximated by sampling the wide range of content-specific NCC. In practice, these two approaches progress hand in hand (Boly et al., 2013). Recent results have stressed the importance of dissociating the true NCC from other neural processes (Miller, 2007; de Graaf et al., 2012; Tsuchiya et al., 2015) that can be considered as “prerequisites” and “consequences” of consciousness (Aru et al., 2012) or alternatively as preceding and following the experience itself (Pitts et al., 2014). Here, factors that modulate the NCC without being directly involved in specifying conscious contents will be called “background conditions” (Koch et al., 2016a) of several kinds (Fig. 1). For example, global enabling factors, such as blood flow or oxygen supply to the cortex, are obviously essential for consciousness, but they do not contribute directly to its contents. Similarly, neuronal activating systems, such as cholinergic and noradrenergic neuromodulation, diffuse thalamocortical projections, and the anterior forebrain mesocircuit, are likely to influence the level of consciousness only indirectly, by modulating the activity of large parts of the full NCC (Schiff, 2010; de Graaf and Sack, 2014). Processing loops involving selective attention, working memory, or expectation may also modulate the probability of specific conscious contents indirectly, by modifying the excitability of content-specific NCC in a task-dependent manner (Aru et al., 2012) concurrently with experience (Postle, 2015; Tononi et al., 2016a). Finally, specific contents of experience are specified by the cortical NCC whether they are induced by sensory stimuli, imagined, or dreamt, suggesting that neural activity along sensory pathways serves as a reliable but indirect trigger of experiential content, rather than contributing directly to it. Similarly, neural activity along motor pathways is essential for reporting the contents of consciousness, but not for experiencing them (Tsuchiya et al., 2015). Definition of the NCC. Content-specific NCC (red) directly contribute to phenomenal distinctions (e.g., low-level visual features, faces, or places) within consciousness. The full NCC (orange) is constituted by the union of all the content-specific NCC. Background conditions to the NCC encompass neural processes that enable or modulate the activity of the full NCC and thus influence the level of consciousness (green), including global enabling factors, such as blood flow or oxygen supply, and neuronal activating systems, such as brainstem reticular formation; neural processes that modulate the activity of only some content-specific NCC, including processing loops involving attention or working memory (beige), sensory pathways activating primary sensory cortices (pink), and outputs from the NCC (blue) involved in task-related verbal or motor reports. V1, Primary visual cortex; V2, secondary visual cortex; PPA, parahippocampal place area; M1, primary motor cortex. Several complementary methods can be used to distill the true NCC. For the full NCC, within-state paradigms can be used to avoid confounds due to changes in behavioral state and task performance as well as to dissociate unconsciousness from unresponsiveness. For example, within either non-rapid eye movement (NREM) or REM sleep one can contrast neural activity when subjects report having dreamt (∼60% of cases in NREM sleep, ∼95% of cases in REM sleep) versus having been unconscious. Patients can also be conscious, although unresponsive and disconnected from the environment, in ∼20% of cases during anesthesia (Sanders et al., 2012) and in ∼35% of cases during complex partial seizures (Johanson et al., 2003). In such cases, methods assessing the complexity of neural EEG responses to transcranial magnetic stimulation can be used to assess the presence versus absence of consciousness in unresponsive subjects (Casarotto et al., 2016). For content-specific NCC, experiments can be carefully designed to systematically investigate possible dissociations between the experience of particular conscious contents and the engagement of various cognitive processes, such as attention, decision-making, and reporting (Aru et al., 2012; Koch and Tsuchiya, 2012; Tsuchiya et al., 2015; Tsuchiya and Koch, 2016). It is especially important to assess the association between the activity of a candidate NCC and the presence of a particular conscious content systematically, across a large number of different experiments (Crick and Koch, 1990). Machine learning approaches can also be used to identify the true NCC as the neural activity patterns most predictive for specific conscious percepts (Sandberg et al., 2014). Ideally, dissociation, association, and prediction approaches applied to lesion, stimulation, and recording studies will converge in identifying a reliable and specific content-specific NCC (Koch et al., 2016a). In that case, one should assume operationally that the relevant part of the brain contributes directly to consciousness: that is, it constitutes a part of its physical substrate (Tononi et al., 2016a). With these methodological clarifications at hand, we will now critically review evidence for the NCC in the front versus the back of the cerebral cortex. Lesion data offer strong causal evidence for the involvement or lack of involvement of different brain areas in supporting consciousness and its contents (Farah, 2004). With regards to the full NCC, several well-documented patients have been described with a normal level of consciousness after extensive frontal damage. For example, Patient A (Brickner, 1952) (Fig. 2A), after extensive surgical removal of the frontal lobes bilaterally, including Brodmann areas 8–12, 16, 24, 32, 33, and 45–47, sparing only area 6 and Broca's area (Brickner, 1936), “toured the Neurological Institute in a party of five, two of whom were distinguished neurologists, and none of them noticed anything unusual until their attention was especially called to A after the passage of more than an hour.” Patient KM (Hebb and Penfield, 1940) had a near-complete bilateral prefrontal resection for epilepsy surgery (including bilateral Brodmann areas 9–12, 32, and 45–47), after which his IQ improved. Patients undergoing bilateral resection of prefrontal cortical areas for psychosurgery (Mettler et al., 1949), including Brodmann areas 10, 11, 45, 46, 47, or 8, 9, 10, or 44, 45, 46, 10, or area 24 (ventral anterior cingulate), remained fully conscious (see also Penfield and Jasper, 1954; Kozuch, 2014; Tononi et al., 2016b). A young man who had fallen on an iron spike that completely penetrated both frontal lobes, affecting bilateral Brodmann areas 10, 11, 24, 25, 32, and 45–47, and areas 44 and 6 on the right side, went on to marry, raise two children, have a professional life, and never complained of perceptual or other deficits (Mataró et al., 2001). A young woman with massive bilateral prefrontal damage of unclear etiology, affecting the right basal, superior, medial and lateral PFC, and the left medial orbitofrontal, frontopolar, and frontal gyri (Markowitsch and Kessler, 2000), had deficits in cognitive functions supported by the frontal lobe, but her consciousness and perceptual abilities were preserved. Medial prefrontal lesions, especially those involving anterior cingulate cortex, can cause akinetic mutism (Cairns et al., 1941), where patients visually track examiners but do not respond to command. Patients who recover from this state typically report that they were conscious but lacked the motivation to respond (Damasio and Van Hoesen, 1983). Clinical evidence. Full NCC. A, Complete bilateral prefrontal lobectomy does not noticeably change the level of consciousness. Top row, Bilateral views of the resected left and right frontal lobes (Brickner, 1936). Bottom row, Postmortem lateral views of both hemispheres (Brickner, 1952). B, Anoxic lesions of posterior corpus callosum predict permanent VS after head trauma (Kampfl et al., 1998). C, Lesions of posterior corpus callosum, with restricted diffusion extending to parieto-temporo-occipital regions, predict permanent coma after anoxic brain damage (Bianchi and Sims, 2008). Content-specific NCC. D, A recent study suggests that intrusive thoughts can be elicited by electrical stimulation of anterior cingulate cortex (Popa et al., 2016). Eliciting any experience is, however, far more common when stimulating posterior than anterior cortical structures (Selimbeyoglu and Parvizi, 2010). E, F, Direct electrical brain stimulation (DES) supports a causal role for different parts of the posterior cortex in specifying conscious content, for example, the right FFA in contributing to face percepts (Rangarajan et al., 2014) (E) and the parietal cortex contributing the feeling of intention to move (F) (Desmurget et al., 2013). SF, Superior frontal sulcus; MF, middle frontal sulcus; IF, inferior frontal sulcus; DWI, diffusion weighted imaging. Moving to the back of the brain, broad bilateral lesions or ablations of posterior cortex are extremely rare (Cavanna and Trimble, 2006). However, traumatic lesions of the posterior corpus callosum, connecting large parts of the posterior cortex, are found in 98% of patients who remain in VS after 1 year (Kampfl et al., 1998) (Fig. 2B). Moreover, such lesions are associated with a 214-fold risk of permanent VS (Kampfl et al., 1998). Posterior corpus callosum lesions also predict permanent coma after cardiac arrest (Bianchi and Sims, 2008) (Fig. 2C). By contrast, traumatic lesions of the frontal lobe, which are found in approximately half of patients with traumatic VS in the acute phase, do not predict outcome (Kampfl et al., 1998). With regards to content-specific NCC, there is abundant neurological evidence that lesions in the posterior cortex can cause a loss of specific contents of experience (Farah, 2004). For example, lesions of the right fusiform face area (FFA) cause prosopagnosia, an inability to recognize faces (Barton and Cherkasova, 2003). Lesions of inferolateral occipital cortex cause achromatopsia, an inability to distinguish colors (Barton, 2011) that, when severe, can be accompanied by unawareness of the deficit (von Arx et al., 2010). Other lesions of the occipital cortex lead to visual form agnosia, a selective inability to identify objects, or simultanagnosia, an inability to perceive more than one object at a time (Farah, 2004). Lesions of the postrolandic cortex lead to a loss of somatosensory percepts, and lesions of left and right angular gyrus impair the conscious understanding of speech and prosody, respectively (George et al., 1996), whereas lesions of the inferior parietal lobule cause a loss of motor awareness (Sirigu et al., 2004). Lesions in left lateral temporal cortex may also lead to selective deficits for the perception of single words or full sentences (Blumenfeld, 2011). By contrast, there is little evidence for loss of specific conscious contents after frontal damage (Penfield and Jasper, 1954). For example, lesions of Broca's area, while impairing speech production, do not typically cause loss of conscious speech perception (Blumenfeld, 2011). Although frontal injuries can slightly increase the threshold for perceiving some brief (16 ms) and masked visual stimuli, patients still experience them (Del Cul et al., 2009), suggesting that these frontal regions may modulate the NCC (i.e., act as background conditions) rather than contributing directly to consciousness (Kozuch, 2014). Electrical stimulation during neurosurgery is an important source of evidence for a direct contribution of different brain areas to consciousness (Penfield, 1959; Desmurget et al., 2013), as indicated by its superior value in predicting postoperative deficits compared with fMRI or diffusion tensor imaging (Borchers et al., 2011). With regards to the full NCC, the classical study of Moruzzi and Magoun (1949) and subsequent studies showed that it is possible to restore EEG activation and behavior in anesthetized animals through electrical or pharmacological stimulation of neuronal activating systems in brainstem, thalamus, and basal forebrain. Recently, subcortical electrical stimulation has also succeeded in increasing the level of consciousness in animals with focal seizures (Kundishora et al., 2017) and in human patients after brain damage (Schiff et al., 2007). In these cases, it is likely that the effects were mediated indirectly, by modulating the excitability of the full NCC through arousal systems. With regards to content-specific NCC, it was recognized long ago that electrical stimulation of most of the frontal cortex does not elicit content-specific changes in experience (Penfield and Jasper, 1954), although it can interfere with task execution and induce involuntary movements (Selimbeyoglu and Parvizi, 2010). Transcranial magnetic stimulation of the frontal cortex also does not seem to modify experiential content, although it can interfere with speech production (Pascual-Leone et al., 1991). Complex hallucinations, similar to those classically reported after stimulation of temporal and parahippocampal regions (Penfield and Jasper, 1954; Mégevand et al., 2014), have been occasionally reported after stimulation of the middle and inferior frontal gyrus (Blanke et al., 2000), perhaps due to a network effect. Recently, however, two case report studies described the occurrence of a will to persevere and of intrusive thoughts after stimulation of the anterior cingulate cortex (Parvizi et al., 2013) and of mid-cingulate cortex (Popa et al., 2016) (Fig. 2D), respectively. Electrical stimulation of posterior cortex induces discrete changes in the contents of consciousness more reliably (Selimbeyoglu and Parvizi, 2010), although some posteromedial cortical areas may remain silent (Foster and Parvizi, 2017). For example, direct electrical stimulation of early visual areas induces simple visual experiences, such as phosphenes (Beauchamp et al., 2012; Winawer and Parvizi, 2016), which can also be induced by transcranial magnetic stimulation of occipital and parietal cortices (Samaha et al., 2017). Electrical stimulation of postcentral gyrus induces somatosensory percepts (Penfield and Jasper, 1954), stimulation of temporoparietal cortex induces experiences of visual motion (Rauschecker et al., 2011), while stimulation of right fusiform gyrus selectively disrupts the perception of faces (Rangarajan et al., 2014) (Fig. 2E). Moreover, the feeling of intention has been elicited in temporoparietal cortex (Desmurget et al., 2009) (Fig. 2F) and out-of-body experiences in the right angular gyrus (Blanke et al., 2002). Together, stimulation studies support the idea that some posterior cortical regions may contribute directly to specific contents of experience, but the evidence for prefrontal regions is scarce and indirect. Compared with lesions or electrical stimulations, neuroimaging studies offer less direct evidence for the contribution of any one brain region to consciousness (Farah, 2004). Indeed, functional activation maps frequently encompass brain areas that may not be directly involved in specifying experiential contents (Silvanto and Pascual-Leone, 2012; de Graaf and Sack, 2014). For example, whereas fMRI and intracranial EEG both reveal the activation of widespread bilateral temporo-occipital areas (beyond the FFA) after the presentation of faces, direct electrical stimulation disrupts face perception only when applied to the right FFA (Rangarajan et al., 2014) (Fig. 2E). However, neuroimaging experiments can sample brain activity systematically and noninvasively in healthy volunteers (Poldrack and Farah, 2015) and, with appropriate methodologies, they can also provide valuable information about the functional specificity of brain regions (Moran and Zaki, 2013; Poldrack and Farah, 2015). For example, neuroimaging experiments can demonstrate dissociations between content-specific NCC and neural correlates of other cognitive processes (Aru et al., 2012; de Graaf et al., 2012) by relying on forward inference (Henson, 2006; Moran and Zaki, 2013). Moreover, ever-growing neuroimaging databases can demonstrate systematic associations between specific conscious contents and the activation of specific cortical areas by using meta-analytic reverse inference (Poldrack, 2006; Yarkoni et al., 2010; Moran and Zaki, 2013; Poldrack and Yarkoni, 2016). Also, multivariate decoding techniques can compare the predictive value of various NCC candidates for specific conscious percepts (Haynes, 2009; Sandberg et al., 2014). As was argued above, the cleanest way to identify the full NCC is to use within-state, no-task paradigms (Fig. 3A–D), which avoid confounds due to behavioral state changes and dissociate consciousness from behavioral responsiveness and task performance. Within-state studies contrasting dreaming versus nondreaming during NREM sleep and REM sleep have pointed to a “posterior hot zone” in parieto-occipital areas, possibly extending to mid-cingulate regions, as a reliable NCC (Siclari et al., 2017). Within-state contrasts applied to brain-damaged patients, comparing VS to minimally conscious state (MCS), also reveal most consistent differences within posterior cortex (Vanhaudenhuyse et al., 2010; King et al., 2013; Wu et al., 2015). Neuroimaging, Forward inference. Full NCC. A, Between-state paradigm contrasting brain activity during NREM sleep and wakefulness (Kajimura et al., 1999) shows a relative deactivation of frontoparietal cortices. B, When subjects are awoken from NREM sleep and asked if they experienced anything before being awakened, EEG data during dream experiences show reduced low-frequency activity (1–10 Hz) compared with dreamless sleep in a posterior parieto-occiptal “hot zone” (Siclari et al., 2014). C, D, Directly comparing patients in an MCS with patients in a VS reveals differences in connectivity restricted to posterior cortex. C, Vanhaudenhuyse et al. (2010). D, Wu et al. (2015). Content-specific NCC. E, F, Tasks involving reporting seen versus unseen stimuli highlight differences in frontoparietal cortices: E, Binocular rivalry (Lumer et al., 1998); F, Visual word masking tasks (Dehaene et al., 2001). G, When conscious visual perception is dissociated from behavior (i.e., button press), only differences in activity in occipital and parietal regions remain (Frässle et al., 2014). H, Conscious perception of weak somatosensory stimuli correlates with cortical changes in BOLD signal restricted to contralateral rolandic and parietal areas (Meador et al., 2017). I, J, An early “visual awareness negativity” ∼200 ms in posterior temporal and occipital areas is found in two masking paradigms: I, Koivisto and Revonsuo (2010); J, Andersen et al. (2016). C, Conscious stimulus; UC, unconscious stimulus. K, Visual one-back paradigm in patients implanted with subdural electrode arrays. The visual cortex (right of the dashed white line) responds rapidly to the seen stimulus (red), whereas frontal regions are modulated by the task (yellow) (Noy et al., 2015). L, A within-state no-task experiment (Fig. 1D), contrasting EEG activity during REM sleep dreams with and without faces, highlighted the fusiform gyrus as content-specific NCC (Siclari et al., 2014). With regards to content-specific NCC, many experiments using bistable perception and masking paradigms have shown the activation of prefrontal areas during conscious perception of external stimuli (for a detailed review, see Dehaene and Changeux, 2011). However, these task-based paradigms recruit areas involved in attention, working memory, and other cognitive processes. If these areas are only required for reporting on the perceived stimuli and not for experiencing them, they should not be regarded as a part of the full NCC (Tsuchiya et al., 2015). The recent study of stimuli that are task irrelevant but experienced (Fig. 3E–L) has made it possible to dissociate the true NCC from various cognitive functions involved in behavioral demands (Aru et al., 2012; de Graaf et al., 2012). During both inattentional blindness (Pitts et al., 2012) and backward masking experiments (Pitts et al., 2014), the content-specific NCC for task-irrelevant percepts are located in posterior cortex, whereas a difference in frontal activity (P3 potential) is only present if stimuli are task-relevant. “No-report” paradigms have also pointed to posterior regions as the NCC, whereas frontal cortex activation is correlated with reporting (Tsuchiya et al., 2015; Koch et al., 2016a). Similar dissociations have been identified by orthogonally manipulating consciousness versus selective attention (Tsuchiya and Koch, 2016), working memory (King et al., 2016), or expectation (Melloni et al., 2011). During REM sleep, a “no-task” state, specific dream contents, such as faces, places, movement, and speech, can be predicted from posterior, but not anterior, cortex (Siclari et al., 2017). The same approach has highlighted a potential contribution of mid-cingulate cortex to conscious thought, whether during waking, NREM, or REM sleep (Perogamvros et al., 2017). Finally, when meditation practitioners become immersed in a state of vivid imagery, activity in their frontal lobe decreases (Lou et al., 1999). 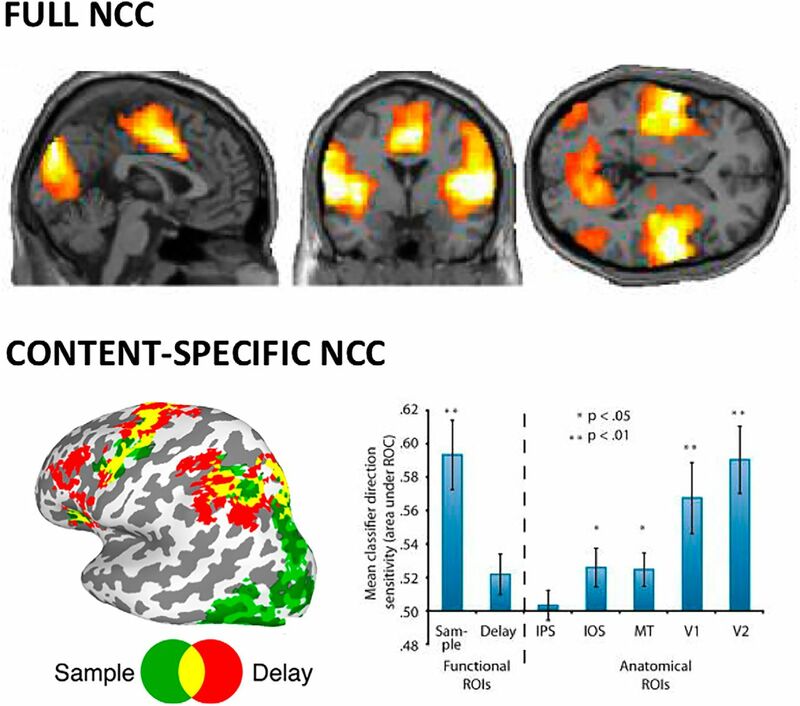 In neuroimaging studies, a content-specific NCC can be characterized as the part of the brain in which a change in activity reliably and specifically predicts a particular change in experiential content. In recent years, several open-access frameworks have been developed to pool data from thousands of neuroimaging studies and assess reliability and specificity (Eickhoff et al., 2011; Poldrack and Yarkoni, 2016). For example, the Neurosynth framework (www.neurosynth.org) (Yarkoni et al., 2011) combines an automated tool to extract activation coordinates with a taxonomy of cognitive processes. Despite significant caveats, such as the use of 3D coordinates of activity peaks rather than unthresholded statistical maps (but see Neurovault, www.neurovault.org) (Gorgolewski et al., 2016) and of functional labels assigned by investigators, these meta-analytic tools can already illustrate reverse inference and generate hypotheses. For example, in a traditional meta-analysis approach, computing the probability that different brain regions are active when the study topics include consciousness, Neurosynth activation maps display some parts of the frontal cortex (Fig. 4A). However, in a reverse inference mode, computing the probability that consciousness is mentioned in the study given the activation of different brain regions, the activation of frontal cortex disappears (Fig. 4B). By contrast, in agreement with lesion and stimulation studies, reverse inference locates the best predictor of face percepts in the right FFA (Fig. 4C,D). Content-specific results for visual words or motion, speech sounds, or touch perception are likewise regionalized to occipital, temporal, and parietal cortices. In all these cases, reverse inference does not highlight frontal areas as predictive for specific conscious contents. Neuroimaging, Reverse inference. A, When using Neurosynth for a traditional meta-analysis, computing the probability that different brain regions are active when the topics of a study include consciousness, parts of frontal cortex show up. B, When using Neurosynth in reverse inference mode, computing the probability that consciousness is included within the topics of a study, given the activation of different parts of the brain, frontal cortex disappears. The key term “conscious” was used on the Neurosynth website to extract both “forward” meta-analysis and reverse inference analysis steps in A, B. C, The same frontal areas that identified in a traditional meta-analysis for consciousness also appear activated in a traditional meta-analysis for faces. D, In contrast, reverse inference for faces no longer identifies frontal cortex activity but rather locates the activation predicting highest probability for face percepts in the right FFA. The key term “faces” was used on the Neurosynth website to extract both “forward” meta-analysis and reverse inference analysis steps in C, D. x, y, z values represent MNI coordinates, and a color scale is used for Z values. Neurosynth also permits the assessment of the functional specificity of brain areas at user-specified coordinates. For example, activation in the FFA (with coordinate selected from the statistical maximum of the traditional meta-analysis, [41, −49, −20]) is consistently predictive for faces (probability p = 0.88), temporo-occipital cortex for visual words ([−46, −54, −12], p = 0.86) or visual motion ([46, −68, 0], p = 0.9), superior temporal cortex for speech sounds ([−58, −10, 0], p = 0.84), and postcentral cortex for touch ([−54, −22, 20], p = 0.88). In contrast, the statistical maximum within the frontal cortex activation obtained from the traditional meta-analysis on consciousness (−47, 6, 28) is found to be most predictive for the terms “phonological” and “task” (p = 0.76 and p = 0.63, respectively). Ideally, decoding approaches would identify the true NCC as neural activity patterns most predictive for the presence of a given conscious content (Sandberg et al., 2014). Unlike classical statistical analysis, decoding approaches also assess reproducibility as the percentage of accurate classification among single trials (Haynes, 2009). With respect to the full NCC, the best predictors for differentiating MCS from VS using PET or fMRI were located in parietal, temporal, and occipital cortices (Demertzi et al., 2015; Stender et al., 2016) (Fig. 5, top). An online prospective approach based on EEG markers of arousal in posterior cortex was able to predict consciousness (dreaming) versus unconsciousness during NREM sleep with 85% accuracy (Siclari et al., 2017). Post hoc analysis also located the areas most predictive for dreaming consciousness within temporo-parieto-occipital cortices (Siclari et al., 2017). Anesthesia studies have shown that frontal activity is a poor predictor of consciousness (Avidan et al., 2011; Gaskell et al., 2017), but there are no data so far for posterior cortex. Neuroimaging, Predictive approaches. 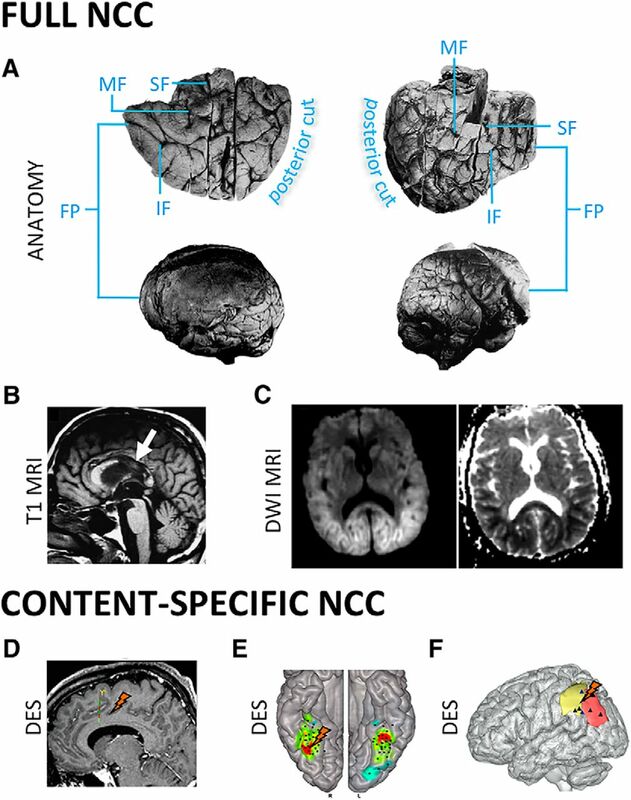 Full NCC, Machine learning approaches applied to fMRI resting state show that temporo-parieto-occipital connectivity best differentiates patients in MCS versus VS (Demertzi et al., 2015). Content-specific NCC, The contents of a working memory task can best be decoded from the back of the brain (posterior green ROI, activated during sample period), but not from the front of the brain (red fronto-parietal ROI, activated during delay period) (Emrich et al., 2013). Right side panel, Classification accuracy to identify conscious contents is much higher for posterior Sample ROI than for fronto-parietal Delay ROI (left part of panel, before dashed line). Classification accuracy is also higher in occipital areas compared with parietal cortex (right part of panel, after dashed line). IPS, Intraparietal sulcus; IOS, intraoccipital sulcus; MT, area MT; V1, primary visual cortex; V2, secondary visual cortex; ROI, region of interest. As for content-specific NCC, numerous studies in both awake and dreaming subjects could decode the occurrence of specific experiential contents from the activity of specific regions of posterior cortex (Nishimoto et al., 2011; Horikawa et al., 2013; Siclari et al., 2017). Working memory contents can also be decoded more reliably from the back than from the front of the cortex (Emrich et al., 2013) (Fig. 5, bottom). Finally, multivariate patterns predictive of differences in subjective experiences both within (Kriegeskorte, 2011) and between subjects (Charest et al., 2014) are most consistently found in posterior cortex. In this Perspective, we have reviewed evidence across lesion, stimulation, and recording studies that consistently point to regions in the “back” of the cortex, including temporal, parietal, and occipital areas, as a “posterior hot zone” that seems to play a direct role in specifying the contents of consciousness. By contrast, evidence for a direct, content-specific involvement of the “front” of the cortex, including most prefrontal regions, is missing or unclear. At a minimum, reports of conscious patients after bilateral frontal lobectomy demonstrate that the prefrontal cortex is not necessary for consciousness. Although most prefrontal regions may be “mute” as regards to consciousness, not unlike basal ganglia and cerebellum, it remains possible that some prefrontal regions, such as ventromedial areas (Koenigs et al., 2007) or premotor areas, may contribute specific conscious contents, such as feelings of reflection, valuation, and affect (Koch et al., 2016b). Below we discuss some promising future research directions. Lesion studies would benefit from a systematic assessment of loss of specific conscious contents after frontal cortex damage, sampling both task-related experiences as well as dream contents (as in Solms, 2014). Future experiments should also investigate possible dissociations between consciousness and cognitive functions, such as attention and working memory after frontal damage, detail the precise 3D location (as in Mah et al., 2014) and laminar profile (Koch et al., 2016a) of the lesions, and control for network effects (Fischer et al., 2016). Stimulation studies should explore the effects of local perturbations on both task performance (as in Winawer and Parvizi, 2016) and subjective experience, for example, using structured questionnaires. Direct electrical stimulation combined with intracranial recordings at the stimulation site and at distant sites (as in Keller et al., 2014; Pigorini et al., 2015) should help to identify specific patterns of functional connectivity involved in consciousness. Neuroimaging studies should further exploit within-state, no-task paradigms to differentiate between the full NCC and neural correlates of responsiveness (Koch et al., 2016a). With respect to conscious content, pooling across an exhaustive set of different experiments (as in Axelrod et al., 2015), including a formal comparison between them (Rutiku et al., 2016) and a combination of report and no-report paradigms (Tsuchiya et al., 2016), should help to identify content-specific NCC as the brain regions most consistently activated in the presence of specific conscious percepts. Systematic meta-analyses using reverse inference will be useful to assess the reliability of NCC candidates while avoiding cherry-picking (Moran and Zaki, 2013). Meta-analytic frameworks, such as Neurosynth, should be modified by explicitly incorporating the dissociation between consciousness and cognitive functions, such as attention, working memory, and task execution. Prospective studies should confirm that the full NCC identified through forward and reverse inferences remains the best predictor for the presence of consciousness across different physiological or pathological states, at the level of single trials, or even online, in real time (as in Siclari et al., 2017). Decoding studies should also explicitly compare the predictive value of different neural activity patterns for specific conscious contents (as in Emrich et al., 2013). Finally, prospective studies should be used to assess the clinical utility of different NCC candidates for detecting consciousness in brain-damaged patients (as in Demertzi et al., 2015; Stender et al., 2016). This work was supported by National Institutes of Health Grant 1R03NS096379 to M.B., the James S. McDonnell Scholar Award 2013 and the H2020-FETOPEN-2014-2015-RIA under agreement No. 686764 (Luminous Project) to M.M., the Templeton World Charity Foundation to N.T., National Institutes of Health Grant MH095984 to B.R.P., and the Tiny Blue Dot Foundation and the Distinguished Chair in Consciousness Science (University of Wisconsin) to G.T. (2011) Neuroanatomy through clinical cases, Ed 2. Sunderland, MA: Sinauer. (1936) The intellectual functions of the frontal lobes. New York: MacMillan. (1990) Towards a neurobiological theory of consciousness. Semin Neurosci 2:263–275. (1983) Focal lesions of the limbic lobe. In: Neuropsychology of human emotion (Hellman K, Satz P, eds). New York: Guilford. (2004) Visual agnosia. Cambridge, MA: Massachusetts Institute of Technology. (2017) Frontal alpha-δ EEG does not preclude volitional response during anaesthesia: EEG findings from a prospective cohort study using the isolated forearm technique. Br J Anaesth, in press. (1949) Selective partial ablation of the frontal cortex, a correlative study of its effects on human psychotic subjects. New York: Hoebar. (1954) Epilepsy and the functional anatomy of the brain. Boston: Little Brown. (2014) The neural correlates of consciousness in sleep: a no-task, within-state paradigm. BioRXiv. Available at: http://www.biorxiv.org/content/early/2014/12/30/012443. (2014) The neuropsychology of dreams: a clinico-anatomical study. New York: Psychology. (2016b) The neurology of consciousness: an overview. In: The neurology of consciousness, Ed 2 (Laureys S, Tononi G, eds), pp 463–471. Amsterdam: Elsevier. (2016) The relationship between consciousness and top-down attention. In: The neurology of consciousness, Ed 2 (Tononi G, Gosseries O, Laureys S, eds), pp 69–89. Amsterdam: Elsevier. We welcome the opportunity to address the issues raised by Boly et al. Much of the basis of our disagreement with their views has already been covered in our article. In essence, we think it is misguided to downplay the role of the PFC in conscious perception based on their selective review of the literature. One useful point Boly et al. raised is that we should carefully distinguish between different aspects of consciousness. In the case of patients with large bilateral prefrontal lesions, we argued that they lack consciousness in the sense of not displaying goal-directed, meaningful interaction with objects in the external world. But one may ask: do they specifically have normal subjective perceptual experiences? Arguably, the most challenging and conceptually important questions about consciousness concern subjective experiences. To clarify the issue, we included a video of such a patient. Our point is that this question is difficult to address in a decisive manner, given the inability of these lateral frontal lesioned patients to provide meaningful responses to queries. Notice also the striking difference compared with another patient with extensive damage to the orbitofrontal cortex, highlighting the regional differences in prefrontal damage and conscious behavior. Despite this difficulty, other evidence based on transcranial magnetic stimulation (Rounis et al., 2010) and frontal lesions (Fleming et al., 2014) shows that such patients are impaired in subjective perceptual experience. We also want to reemphasize that patients with extensive bilateral parieto-occipital damage with visual agnosias are also conscious by the criteria of showing goal-directed actions toward the external world. This is not to say that these regions are not critical for aspects of sensory perception, as noted by Boly et al. We think that this exchange is an important reminder that data interpretation often depends on details. As such, we are unsure about their suggestion that we can make use of meta-analytic databases, such as Neurosynth, to definitively settle these issues. In some areas of research, meta-analysis is no doubt useful. But consciousness is an emerging field, where discussion regarding, for example, what counts as an appropriate experimental design, what existing measures are valid, and how to control for confounds, is important. A case in point is perhaps a recent study by some of the same authors as Boly et al. on EEG correlates of dreams (Siclari et al., 2017). As pointed out in our article, a significant finding emerged in PFC but was not emphasized, similar to other examples in recent literature. A meta-analytic study may well miss the positive prefrontal results because they were not reported and highlighted as main findings by the authors. Such meta-analytic approaches may also overemphasize neuroimaging methods with limited sensitivity. Instead, we advocate the importance of continuing the present kind of conversation in depth. Traditionally, much discussion on human consciousness takes the form of authoritative scholars advocating intriguing theories and ideas, but placing relatively little emphasis on conflicting data. To make true progress as a rigorous scientific field, we need open and legitimate platforms, on which theoretical viewpoints are critically scrutinized and evaluated from multiple angles. The meetings for the Association for the Scientific Studies of Consciousness provide excellent opportunities for us to continue these kind of debates, as well as the opportunity to keep up to date with this burgeoning and exciting literature. Finally, Boly et al. cite 2 articles in their response (Schoenemann et al, 2005; Kennedy et al, 1998). Boly et al. 's conclusion is that the non area 4 and 6 PFC is only 13% of the cortical mantle. They fail to notice that the criteria for PFC was tissue anterior to the genu of the corpus callosum. Simple inspection of Fig 1a in Schoenemann et al (2005) reveals that this method severely underestimates PFC (note the location of the central sulcus on the right of Fig 1a.) The true percentage of non area 4 and 6 PFC is closer to 20–25% of the cortical mantle.